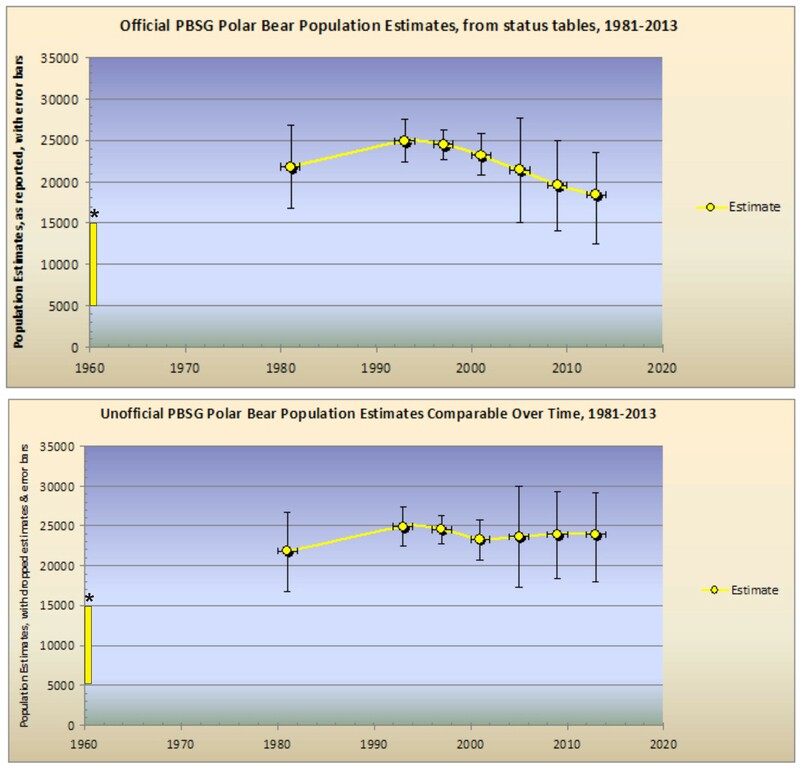 What is apparent is that the global population of polar bears has not declined over the last 30 years, as the PBSG status tables indicate. Although it’s true that the official estimates for 2005 and 2009 publicized by the PBSG (“20,000-25,000”) also indicated no recent change, the numbers listed on their status tables don’t tell the same story. What’s the point of insisting on supposedly more accurate “scientific” estimates if you don’t use them to generate your official total? Note that the most recent status table released last week, for 2013, did not include a new total — if you wanted to know if the global total had changed (and if so, by how much), you had to add the figures up yourself. Nowhere on the PBSG website does it now list an official population estimate. What’s that about? Finally, note that I’ve included a ballpark estimate for 1960 that reflects international concern that many years of unregulated hunting had seriously depleted populations, as occurred for numerous other species (indicated as a broad range rather than a single figure). 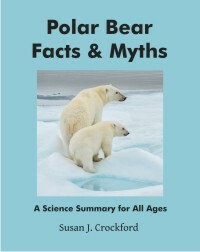 And while it is true that no one truly knows how many polar bears there were in 1960, it is also true that by that time, over-hunting had occurred on a large scale for decades, and that there were fewer bears then than there are now (see another discussion of that topic here). Fig. 2 Graph using the figures listed in PBSG status tables only. As I’ve pointed out previously, adjustments made to the PBSG status tables that dropped to zero estimates that had formerly been included in the global totals suggested that by 2009, the totals must actually have increased by 2650 to 5700 bears since 2001. 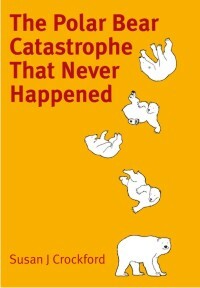 So to make the population estimates comparable over time, we really need to add back in the ballpark estimates for the Queen Elizabeth Islands (which includes any bears residing there and in the Arctic Basin, last estimated at 200 bears), East Greenland (2,000 bears) and the Chukchi Sea (2,000 bears)1, which were dropped in the 2005 and 2009 PBSG assessments, as well as the estimate for the Laptev Sea (800-1200 bears, dropped in 2013, discussed here). Figure 3. Graph using figures from the PBSG status tables plus “inaccurate” estimates dropped between 2005 & 2013. 1. Although the estimate for this region is indeed less “scientifically” accurate than those from regions that have been surveyed, it is very clear that large number of bears reside in the Chukchi Sea. For example, Rode and colleagues (Rode et al. 2014) used an estimate of 2,000 for the Chukchi Sea region (“based on extrapolation of den surveys”) to argue that the Chukchi and the Southern Beaufort population of bears were of “similar size.” PBSG biologists apparently like to have it both ways: ignore the Chukchi estimate when it doesn’t suit them (for global estimates) but include it when they need it for statistical work. 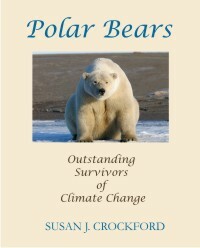 This entry was posted in Conservation Status, Population and tagged Chukchi, East Greenland, estimate, graph, Laptev Sea, PBSG, polar bear, polar bear numbers, Polar Bear Specialist Group, population decline, population estimates, population increase, population over time, Queen Elizabeth Islands, Rode, stable population, status tables, timeline. Bookmark the permalink.